It’s actually pretty easy to close a business but, it comes with a grieving period. Hopefully, I’m not writing this too soon. In 2011, I came back to Canada with way too many business ideas. A friend of mine dropped his boring job and we got to brainstorming full-time. I wanted to avoid the problems I saw with my previous startup, bootstrap a company to greatness and get over my fear of partnerships (I had had bad experiences). This is about the time that the Lean Startup came out so, we used that. For weeks, we filled post its with ideas, problems, market insights, trends; everything to make well-informed rational market decisions. As my original partner decided to leave the business, a technical cofounder joined. The wheels were in motion, we were going in employer brand monitoring, a direction I had half-chosen. The week my original partner left was the week I convinced Louis-Philippe to join. I was having serious doubts but, I had sold him on a business I was trying to believe in. I had learned that, with half the time you get half the results so, for HireVoice, I was all-in, committed to success or, at least, piling up debts. Because my partner and I didn’t have prior expertise in HR or recruitment, we had to build credibility, a professional network and learn the basics so, we got advisors early on. You lose a lot of time learning a domain which isn’t yours. You will never be as credible as a subject matter expert with established industry contacts. Get one! In retrospect, I’d say we probably lost 4 months learning recruitment and HR. That’s 4 months we could have spent getting clients. Because I was full-time on HireVoice and, validating a product was a part-time job at this point, I was investing time in socializing HireVoice with the investment community and all kinds of smart people. Although this felt like momentum, it was side-tracking us from focusing on product-market fit (the only thing that really mattered). Focus is key when launching any business but, small wins were probably not celebrated as much as they should have. We were doing good things but, my impatience was probably causing unnecessary stress. Momentum is essential to motivate team and partners. Small wins are important and must be celebrated. We started validating products with customers in the first few weeks and were always getting very positive feedback. We started building the first module of our solution because we felt we were on the right track. « Interesting » is a distraction. Watch out. Our first product was the first step of the employer brand assessment cycle. It was logical but, in retrospect, we should have selected the module that solved the biggest pain. Everyone we met in recruitment was getting excited about our passive candidate perception module. The idea was to tell them what passive candidates (candidates not currently looking for work) think of their company as an employer. Right… So, we built this module as well and went selling. User acquisition is never an after-fact. Always know how you’re gonna acquire users. We could have made the user acquisition part work but, ultimately, what made us change product was the fact that companies were not buying. It was just interesting. People don’t need more information, they need better knowledge. We tested 2 more products to help companies harness perception of their employer brand but, those products were probably a bit ahead of the curve. Strategy is the fun part. It’s what people want to keep doing. Don’t try to automate. In the process of finding product / market fit it’s very easy to lose track of what you, the entrepreneur, want. Because of the nature of the information we were trying to sell and the price of our product, we were targeting large companies and I had to wear fancy pants to work. It was never something I wanted to do but, it kinda just happened. At this point, HireVoice was part of the MIT coaching program. Their approach focused on identifying the biggest pains of a target market. For a month, I met with HR managers, directors and VPs and was able to identify their pains, budgets, needs, buying processes, team structures, etc. We realized that we had been fooling ourselves in thinking that employer brand perception was an important problem. It was a problem but, it didn’t hurt enough for them to pay for our solutions. We decided to go into recruiting. Pick your problem or market before picking your partners and advisors. They might not stay on board if you change. We established trust and relationship by becoming partners in the recruitment success of in-house HR recruiters (your success is our success). We set up a product validation group with 5 or 6 target end-users. They were helping us solve their own challenges. Those ideas were looking very promising. Validating products is also creatively tiring. At some point, it is possible to run out of product ideas. We were validating products faster at this point but, 8 months in, we were tiring out. I’m not sure if it was a failure in leadership but, it was definitely a failure in creating sustainable momentum. Find an enemy for the company to rally and position against. Find a cause or mission for your business to frame the discussion around doing good. I wanted to do one last round of validation before closing HireVoice. I built an ideal product that did everything a recruiter might want (magic!) and went out pitching. We had built (or built part of) 5 products at this point. We knew we had great customer research, knew the problems of our targets but, the motivation was not there anymore. My magic solution was interesting… People were not throwing money at it. In the end, I did what I do with every big decision. I asked myself if 1, 2 or 5 years from now I would regret closing the door on HireVoice. The answer was no. Not all problems lead to sell-able solutions. As was the case with Flagback, my previous startup, I have learned enough through HireVoice to justify the monetary investment (it’s basically like a Bachelor’s degree). I was able to get over my fear of partnerships and realize that I work well with complementary partners. I also realized that I am not a salesguy. I don’t think I’m bad at it but, this is not what I like to do. Overall, I would not recommend starting up in recruiting. It’s a slow-moving market dominated by what LinkedIn is doing or could be doing. Budget for technology is limited as HR is usually perceived as a cost-center. End-users are rarely the buyers. Moving forward, I have published my new and evolved model for the year to come. I will be taking a bit of a step back but, generating online sales will be the focus of my future endeavours. I’m looking at unsexy startups. It’s better to fail in private. Don’t involve close contacts, friends and family. Partner team composition drives business direction. Partnering with devs always leads to R&D and tech as a competitive advantage. The window of opportunity for a startup team to gain momentum is 6 to 8 months. Validating a product is not a full-time job. Building a product is. Quebec is not a good test market. Canadians purchase 2x faster, Americans 4x faster. Start elsewhere. 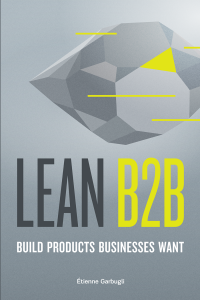 This story, and more than 20 other case studies, are now part of the book Lean B2B: Build Products Businesses Want, a book that consolidates the best thinking around Business- to-Business (B2B) customer development to help innovators and startups quickly find traction in large businesses, leaving as little as possible to luck. Sounds like you have made a very well thought out decision. Good luck in your new endeavours! I'm sorry, but with all the "Tweet this" call outs in between I find the article hardly legible. Stopped reading half way through. I was testing Clicktotweet for this post. Thank you for reading the first half and thank you for your comment. Good luck in your next endeavor! (ps, a few less tweet this please ). i think its the comments code you have. i didnt pick a image, it just gave me that one. i had no idea who it was lol. also, i have no idea how to change it, i just tried attaching an image, but not sure it worked. "We were also seeing the limitations of the Lean Startup methodology. B2B being relational, you can’t just change product every week. Btw landing pages and mockups don’t create a lot of trust…"
This was the most refreshing part of the post for me. I've mostly drunk the LS Kool-Aid but am stuck in a high-touch B2B world. A little reality check is *always* a good thing. Thank you for the feedback. LS is definitely interesting as a concept but, it's not well-adapted to the B2B world. It's for a certain kind of startups (probably B2C or small biz B2B) but, this I had to realize for myself. :) Have you found a way to make part of LS work in your context? Your great content or product won't pick up without proper marketing.